The Irish horse racing authorities are set to ban for life any horse that tests positive for steroids. Horse Racing Ireland (HRI) says it will support the recommendations of an Anti-Doping Task Force set up in the wake of a ban given to trainer Philip Fenton. 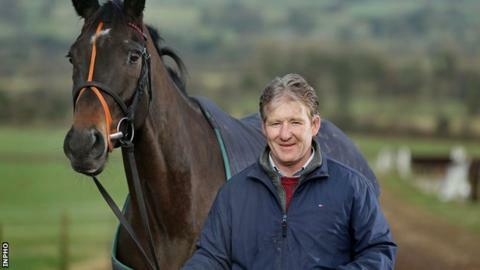 Fenton was convicted by Irish courts of eight charges of possessing outlawed drugs, including anabolic steroids, and banned from racing for three years. Horses in Britain are barred from being trained for a year for steroid use. Since March 2015, horses which test positive for steroids in Britain are also banned from competing for 14 months, a policy which the British Horseracing Authority says its is "comfortable on all existing science". Among the other measures proposed in the report published by Horse Racing Ireland is increased frequency of out of competition testing. In response to Fenton's disqualification in 2014, the HRI Board, in conjunction with the Turf Club, established a 16-member industry-wide Anti-Doping Task Force, chaired by HRI vice-chair and now senior steward of The Turf Club, Meta Osborne, to assess the issues. Brian Kavanagh, Chief Executive of Horse Racing Ireland, said: "Setting up the Anti-Doping Task Force was vital in order to protect the reputation of our racing and breeding industry. "Horse Racing Ireland welcomes the consensus reached and the strong recommendations that have been set out. "The industry is worth over €1 billion annually to the Irish economy, and our international position as a world leader must be maintained. "HRI will support the recommendations of the Task Force through the significant and continuing investment that is being announced today. The issue of illegal performance-enhancing drugs is one that needs to be addressed worldwide and Ireland is now to the fore in tackling this problem head on. "Our primary concern is to ensure that Ireland's racing and breeding industries have drug testing systems that meet the best international standards."